Marcus Bussey wrote a beautiful poem for DragonFire. Unfortunately, we couldn’t incorporate it into the eBook. Here’s the poem by Marcus and illustration by a young talented artist, AnnGee Neo. In the beginning was Light! when all that is began to unfold. 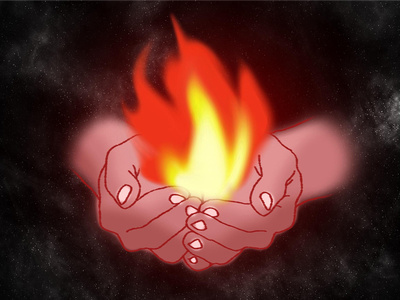 In our hands Light became Fire. Our love of Fire gave birth to Culture. to tell stories, cook food, share memories. 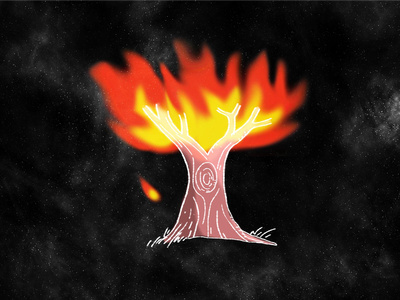 We tamed Fire and Fire tamed us. as a seed becomes a tree. to carry our drink, to cherish our Dead. came bricks to build homes, villages and cities. As these things arose communities grew and flourished. it gives birth to Us. 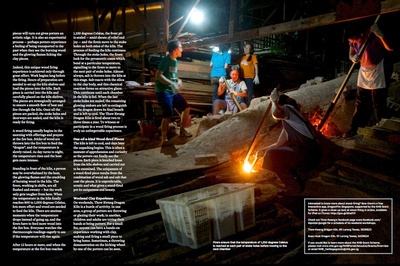 Wood firing and Thow Kwang dragon kiln is featured in MUSE! MUSE is a quarterly publication on museum and heritage-related events by the National Heritage Board. 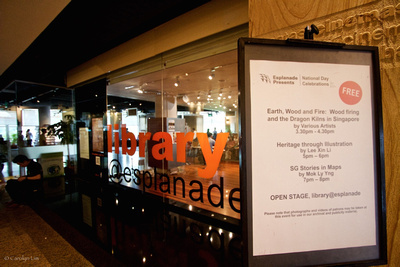 We gave a talk, Earth, Wood & Fire: Wood firing and the Dragon Kilns in Singapore, at the Library@Esplanade during the Jubilee weekend, on the eve of National Day. All the potters came out in full force to share. 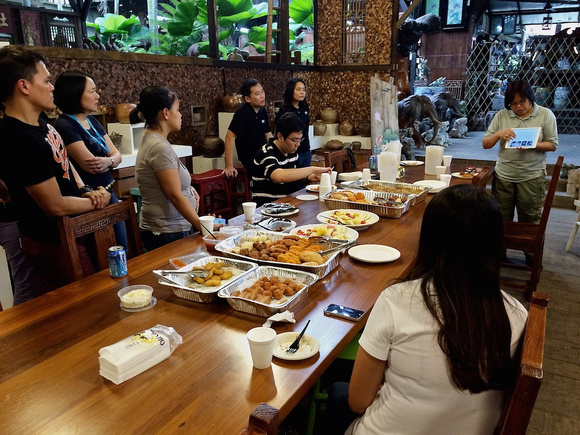 When we were planning the presentation, we didn’t want to do the usual slideshow presentation, – we wanted the audience to participate and have a hands-on experience. We decided on a round-robin format whereby the audience would move from station to station. After proposing this idea with the organisers and looking at the logistics in terms of space and layout, we had the go ahead. We gave the round-robin presentation over the course of 1 hour. 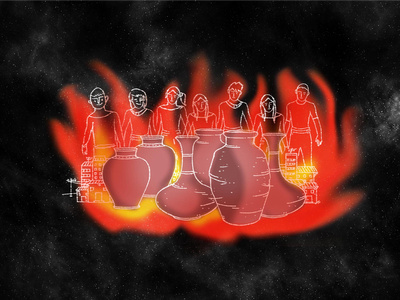 There were 3 stations, each manned by 2 or 3 potters. At Station 1, the potters gave a coiling and slab making demo; Station 2, they showed the DragonFire app, focusing on the time lapse videos and the 360 degree effects; and the potters at Station 3 with an assortment of leather-hard, bisque, wood-fired and non-wood-fired samples explained the effects of wood firing. 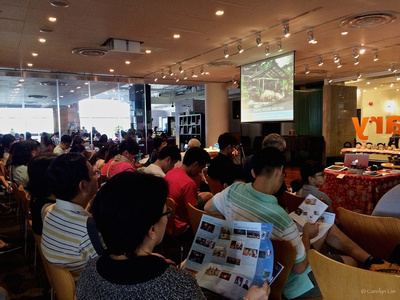 The talk began with an introduction on the history of the ceramic industry, after which the audience would be divided into 3 groups and went to one of the stations. After 15 minutes, a bell rang and they moved to the next station. 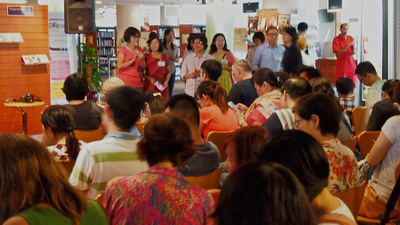 At the end (after 3 rounds), everyone assembled in the seating area again for a Question and Answer session. Station 1 was where everyone had a hands-on demonstration on coiling and slab making. 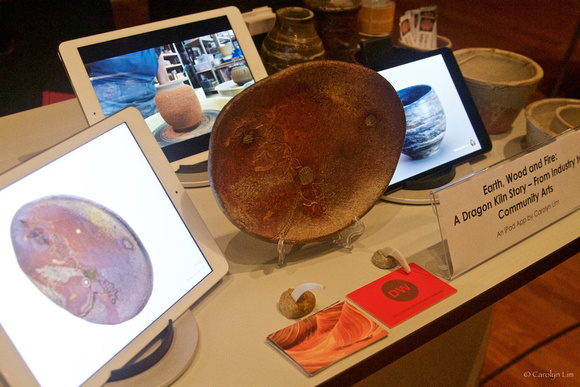 Station 2 featured the dragonfire app focusing on the timelapse videos on pot making and wood firing effects. 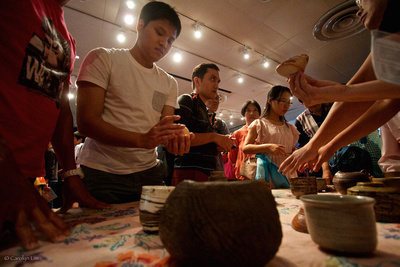 Station 3 highlighted the wood-fired pieces and the audience was able to touch and feel them. 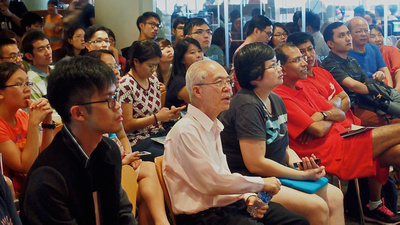 The audience was attentive and interested in wood firing, the questions came fast and furious! 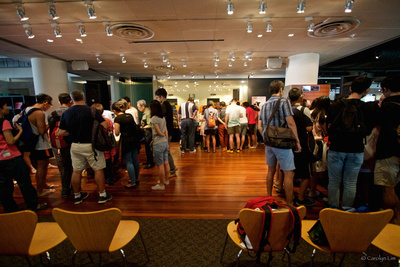 A big thank you to Khoo Ee Hoon, the staff of the Esplanade and the Library@Esplanade for the opportunity to share our passion for ceramics and wood firing. 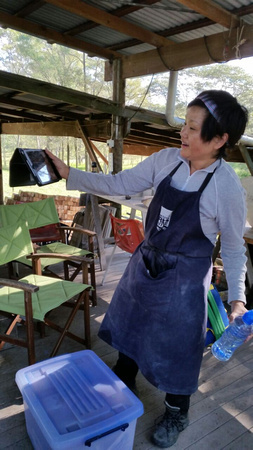 A wood firing session at Thow Kwang dragon kiln presented an ideal opportunity to share the dragonfire app. 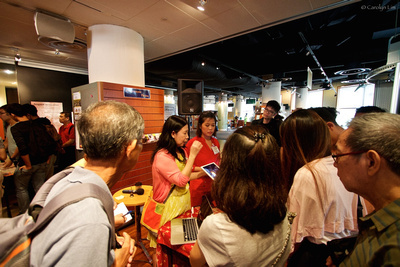 On the evening of 19th June, about a dozen staff from Jurong Town Corporation had a close-up look at the dragonfire app. The app complimented the sights and sounds of a real wood firing that was going on round the corner. 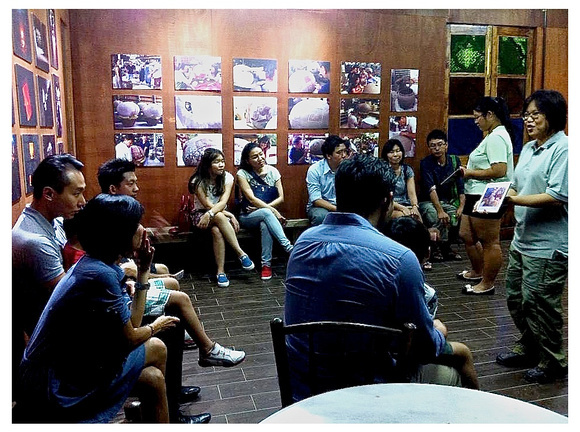 Later that night, visitors to the wood firing had a tour of the dragon kiln and the surrounding workshop area. During the tour, the visitors were introduced to the DragonFire app, which supplemented the ‘live’ firing outside. 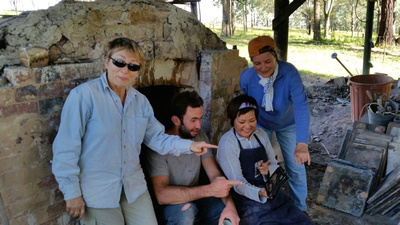 Through photographs in the app, the visitors got to see the interior of the kiln and what could be happening in the actual firing, which was not visible to them at that moment. The information, videos and images in the app gave the visitors a more complete picture of the processes of wood firing as well as the historical significance of the place. 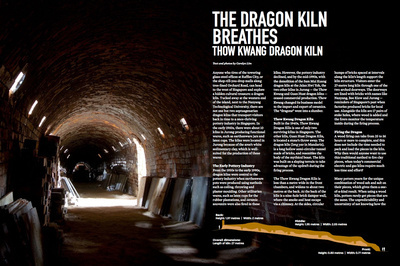 Potter Elizabeth Rowe from Sydney wrote an article for Issue 62 of The Log Book on Thow Kwang Dragon Kiln and the DragonFire App. 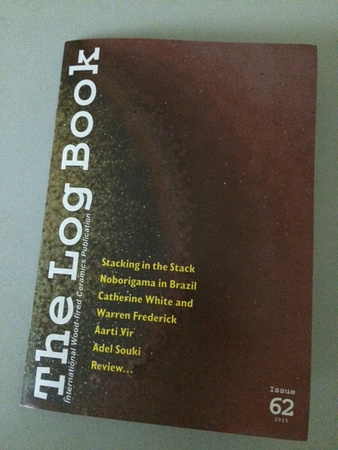 The Log Book is an international publication, published quarterly, which focusses on wood firing and wood-fired ceramics. Edited by renowned ceramicists, Coll Minogue and Robert Sanderson, The Log Book is a valuable resource for wood firers around the world. 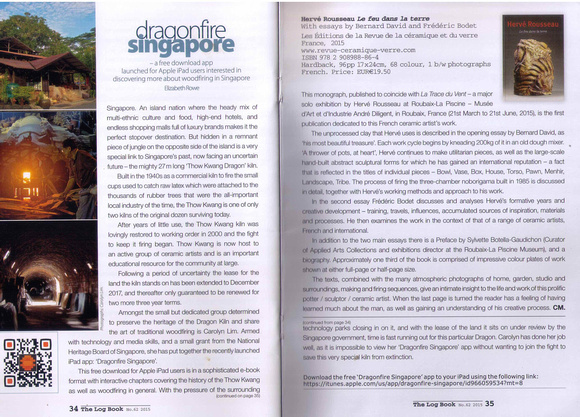 We are very happy that The Log Book would feature the DragonFire App, and expose it to a worldwide audience. 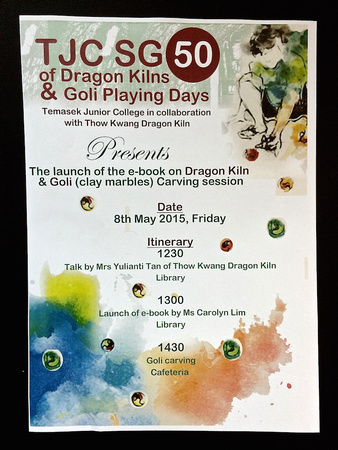 DragonFire at Temasek Junior College (TJC)! 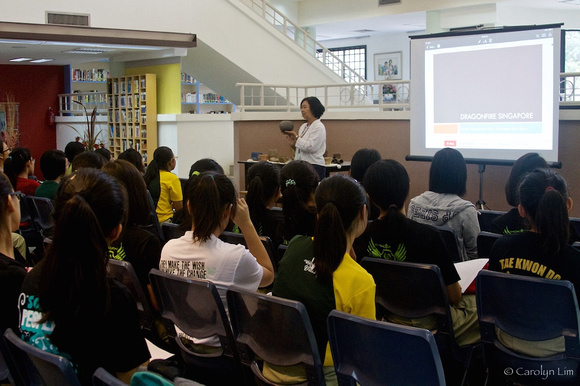 Carolyn Lim and Yulianti Tan presented the app to some 30-40 students at the library. We brought along our wood-fired pieces and had a show and tell session. 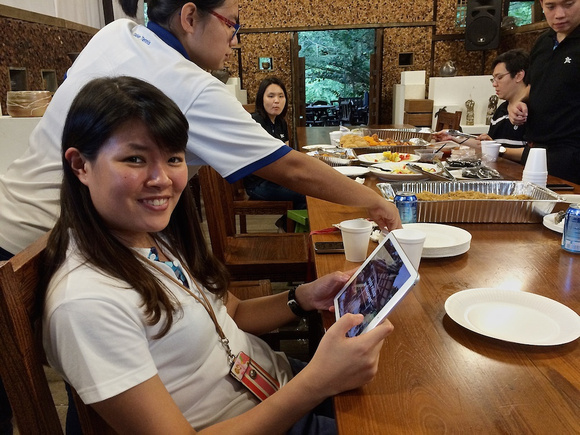 TJC’s principal, Ms Leong and her staff joined us and took a quick ‘tour’ of the app. 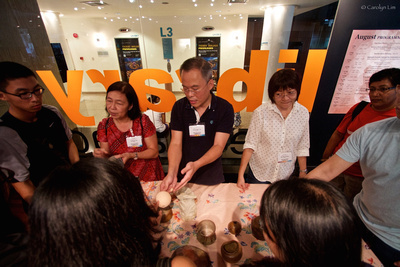 After the presentation, the students and staff had a hands-on session, carving clay marbles (goli). 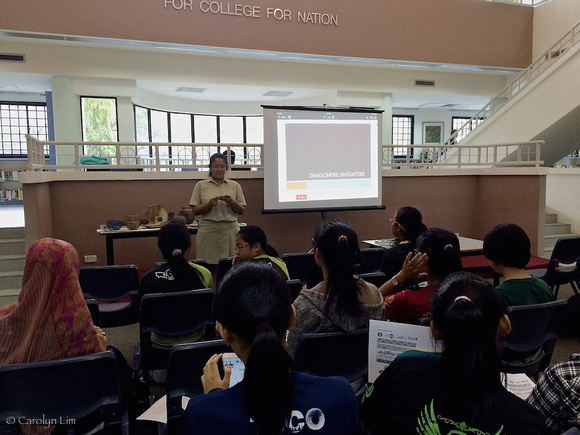 A big thank you to teacher, Ms Salamah Ishak and her students for collaborating with us. 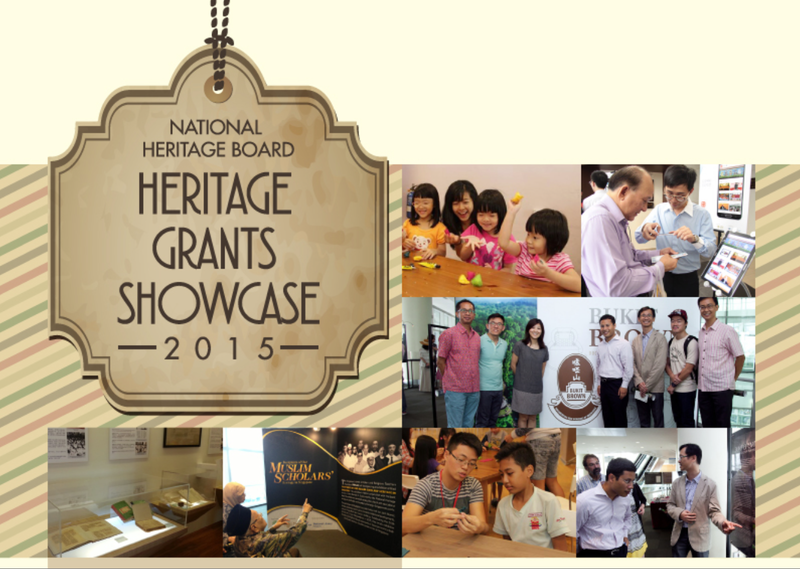 Organised by the National Heritage Board, the Heritage Grants Showcase was held at the National Museum. 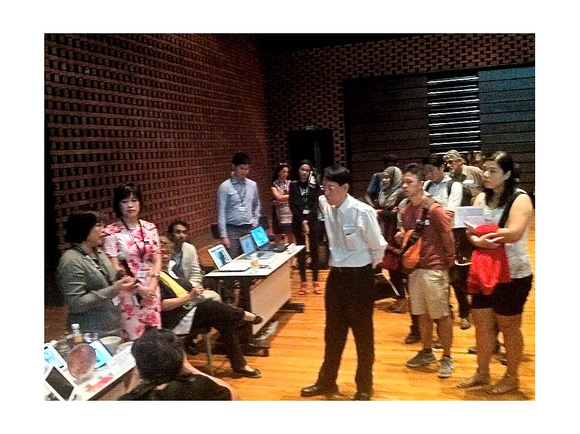 We shared with the public our experience in developing the Dragonfire app and its concept. Other grant recipients were also present to show their work. There was an interesting mix of projects from card games to paintings and publications. 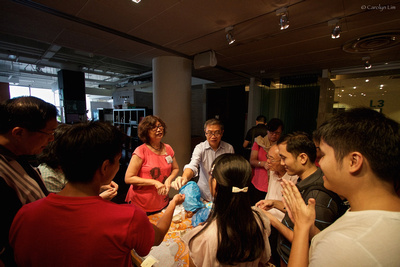 Carolyn Lim, Chia Hua Hoong, Tan Tuan Yong, Jeannette Lau, Ng Siew Kuan and Yulianti Tan were at hand to answer questions from the public. Received these beautiful photographs of Elizabeth Rowe and her friends in Sydney, Australia. 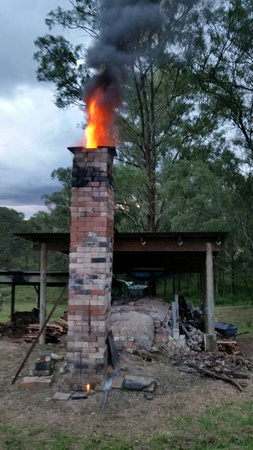 Elizabeth and her group of wood firers had a firing in Western Sydney, Australia in late March. During the long firing hours, she shared our DragonFire App. 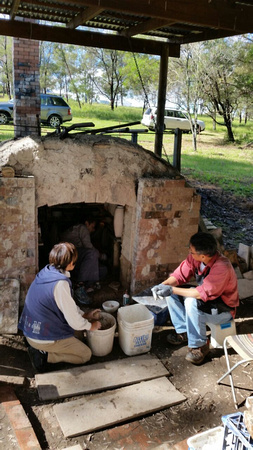 Their kiln, located at North Richmond at the foothills of the Blue Mountains is fired once a year by their teacher Barbara Campbell-Allen and her students. 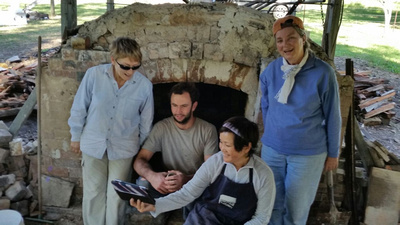 Elizabeth Rowe and her woodfiring friends around thier kiln near Sydney viewing the DragonFire App. Here are some shots of their charming wood-fired kiln. 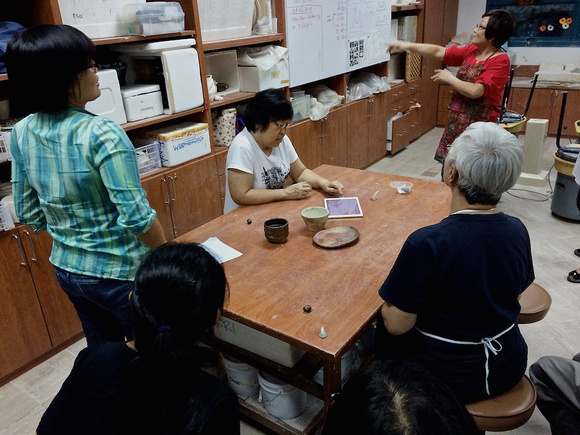 I dropped by Toa Payoh West Community Centre to introduce the DragonFire app to a ceramic class. 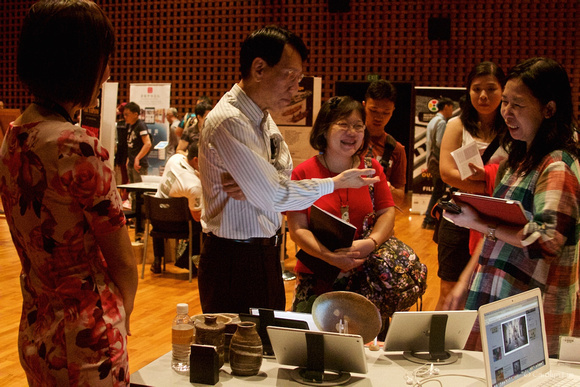 A class of 8 students took a short break from their clay making to preview the app. Generally, they found the app visually pleasing and the information insightful. Although they have been doing studio pottery, some of them had not seen a wood firing. A few suggested the app be made available on the Android platform.